Celebration of Life Services for Patsy Lewellen, 88, of Mobridge will be at 11 a.m. on Friday, Oct. 14, 2016, at the First Baptist Church in Mobridge. Inurnment will be in Greenwood Cemetery under the direction of Kesling Funeral Home of Mobridge. 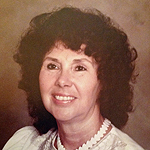 Patsy passed away Saturday, Oct. 8, 2016 at the Golden Living Center in Mobridge.